Another mentioned that he thought the actors were doing the best they could. But. But? As the title suggests, Doubt is a teaching story, figuring the incessant problematic of faith in rigidly dogmatic Sister Aloysius’s certainty that the personable Father Flynn sexually abused Donald Muller, the school’s first black student. The story is set in the Bronx, during the fall of 1964 and the historical background matters because the characters also function allegorically for larger social shifts and ruptures. In 1962, Vatican II opened, but would not close until 1965, when the Council famously challenged the relationship between the Catholic Church and the modern world, acknowledging that truth could exist outside the community and declaring that the mass could be given in vernacular languages instead of Latin. Sister Aloysius embodies these past certainties and the Church’s previously unquestioned authority in all things moral, which tended to be, well everything; she suspected children of harming themselves to play hooky and saw sexual abuse in slight gestures. In contrast, Father Flynn represents the newer, hipper face of the Church; he plays basketball, wants to sing secular Christmas carols, and likes his tea sweet, perhaps even, too sweet, hmm? Similarly, even though Donald Muller never appears onstage, his shadowy presence signals that like the Catholic Church, New York society was also changing and nowhere more than the Bronx. In 1963, Robert Moses’ Cross Bronx Expressway was completed. The bridge displaced families and businesses, was a constant source of noise and air pollution, and catalyzed the decline of the South Bronx from a district of family neighborhoods and businesses to the poorest district in the United States, despite its proximity to Manhattan. In fact, the South Bronx erupted into American national consciousness in 1977, when during a baseball broadcast, Howard Cosell exclaimed, “Ladies and Gentlemen, the Bronx is burning!” Sister James and Mrs. Muller are left to deal with the spiritual and practical aftermath, respectively. Sister James agonizes over the meaning of faith when innocence has been shatter and Mrs. Muller begs to protect her child despite his “differences”. Donald is black and may or may not be “that way” — his father and former classmates regularly beat him because they suspect he is — although Stonewall was only five years in the future, 1969. 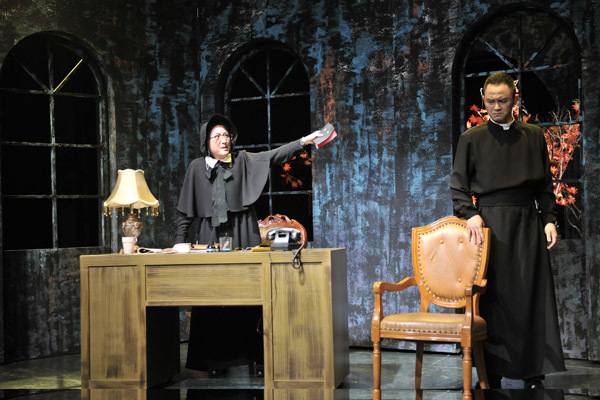 This entry was posted in noted and tagged catholicism in china, cross cultural misunderstanding, doubt, exegesis, former catholic, musing, prd culture, religion, shenzhen, theatre review. Bookmark the permalink.